What better way to celebrate the 4th of July (I know I’m late) than by presenting a classic work of American realism? 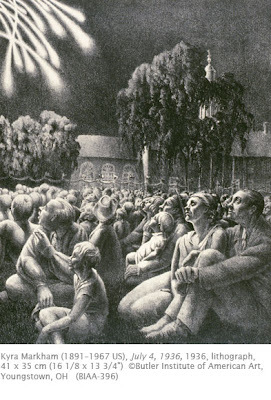 I’ve always had a soft spot for the realism that dominated art during the Great Depression (1929–1940), perhaps because I often fondly thumb through the super-realistic drawings my daddy made in high school. Daddy grew up in Illinois and was definitely influenced by regional artists such as Grant Wood and John Steuart Curry. What makes the art of this period so interesting is the sympathetic attention to the common person and everyday life. An interesting manifestation of the social realism of the Depression era was the so-called Fourteenth Street School in New York. When more than one artist works consistently with a particular subject matter or locale and within the confines of style, the group, however small in number, is sometimes referred to as a school. The Fourteenth Street School refers to the artists Kenneth Hayes Miller, a teacher at the Art Students League in New York, and some of his pupils and comrades which included Kyra Markham. The “school” included other notable artists such as Isabel Bishop and Reginald Marsh. These artists depicted the life they saw around them, sometimes with humor or irony, and sometimes with sympathy. For the most part, the artists of this group were influenced by the monumental realism of the Italian Renaissance, however their subject matter was notably banal. Kyra Markham was a very interesting person. While she studied at the School of the Art Institute in Chicago from 1907 to 1919, she also gained significant experience as an actress on stage and in movies between 1909 and the 1920s, first in Chicago’s Little theater and then in Los Angeles in silent films. While acting, she supplemented her income by painting murals and as an illustrator. In 1930, she returned to concentrate on art when she studied at the Art Students League in New York. In 1934, she studied printmaking which was the pivotal moment in her career as an artist. During the remainder of the Depression, she produced lithographs as an artist on the Works Progress Administration’s artists’ program (1934–1937). She was a member of the National Association of Women Artists, the Southern Vermont Artists, and the Deerfield Valley Artists. This lovely depiction of a fourth of July celebration is typical of Markham’s realist style. What a great way to celebrate the spirit of the national holiday! It embodies both one of the elements of design, value, and one of the principles of design, contrast. Here you will find a resource for research into women’s art. This image is fabulous! I love how everyone's face is so expressive! Looks like your dad had great taste.